Ask fellow campers about "Orchard Valley RV Park" and nearby attractions. We stayed here while visiting friends in Kelowna and enjoyed the park and the owners. As others have said, the sites were quite long and accommodated our Jeep and RV hooked up. There were tall hedges between sites so we had a lot of privacy. The sites were level, the hook-ups were good. We did not use TV but our Verizon was fine here. Veggies from the garden are available for purchase. Interesting to see a working farm and our views were of the owners actually out in the field. We woul definitely stay here again. I thought the price high bu it was the going rate in this area. We also benefitted from the 75% exchange rate. We camped at Orchard Valley RV Park in a Motorhome. Access to the park is good. Easy to find and pavement all the way. Parameter road is dirt with a spattering of gravel and lots of pot holes. Check in was different. We arrived without a reservation but had called ahead to find out if they had a space. Their Web Site specifies $30.00 and up depending on site, date and lenghth of stay. We were appointed a space (11) and were told to go get set up and then we would be checked in. There is no office per say. I was invited into the owner's kitchen and we proceeded to complete the transaction. I was expecting to pay $30.00 night as this is off season and the spot they gave me had "NO" services! It was late in the day and we were already set up otherwise I would have left. I would have been just as comfortable at a Walmart. Our site was level loose pea gravel that was easily tracked in to the coach. We did have cedar trees to give us some privacy. We were the only transients in the park. There was a trashy old school bus with a lot of baggage across from us but the rest of the units didn't look too bad. There were no restaurants or shops withing walking distance. We paid $45.00 night and feel we paid way too much. We did not like being tricked into staying here. We will never return. We camped at Orchard Valley RV Park in a Motorhome. The spots in this small park are spacious. Each has nice tall hedges on either side, you wouldn't know you have neighbors beside you. Nice quiet area. Hook-ups are convenient and worked well. Spots are level. Staff were pleasant and they offer cable boxes so you can receive a number of tv stations. Location is convenient for stores and seeing sights around Kelowna if you have a vehicle. Will definitely stay here again. We camped at Orchard Valley RV Park in a Motorhome. This is a family run RV park consisting of 10 back-in spaces surrounded by orchards. The spaces are approximately 26' wide and 45' long. There are privacy hedges and trees between each lot and the lots are gravel. Each lot has full hookups of power, sewer, water, basic cable and an older picnic table. The hookups are located about 2/3 of the way back. Free WiFi is available and is quite good. There is shower and bathroom facilities at the main house as well as a washer and dryer. The laundry is a bit finicky and some coins can become stuck. Using toonies and loonies is not recommended as they will only get counted as quarters. Seema, the owner is friendly and she can be contacted most effectively by phone or by going to the office. The office is located at the main house through the deck gate. 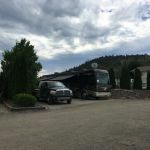 Unfortunately, the cost of RV parks in the Okanagan are fairly high. If you were in the USA, you would get a paved lot and a pool. RV parks in Canada tend to be more on the rustic side. 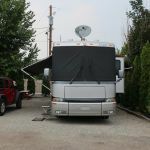 We camped at Orchard Valley RV Park in a Fifth Wheel. North Glenmore has 2 nice little malls right next to each other on Kane road, which is only a 2 minute drive from the RV park. With two grocery stores, pharmacy, liquor store, pubs and numerous restaurants, you don't need to fight with Kelowna traffic in town. Surprised to learn this is first review as park been in operation for about 10 years. There is often confusion between this park and the one adjacent on same short road (Rojem). Both are small "mom & pop" operations in the heart of fruit orchards. This park was originally very nicely landscaped with bark mulch and shrubs surround each site. However landscaping has been allowed to deteriorate. Sites are large and hookups are well placed. The tap at our connection was leaking badly. I informed management and shortly thereafter I found a new tap at the site, waiting to be installed by me. I did not have the tools or inclination to do this repair and the tap was left to leak. Wi-Fi is present but quite spotty and temperamental. 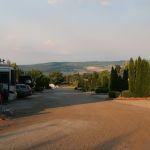 The park is located just a short drive from downtown Kelowna (5 kms), handy to groceries and supplies. Beware, the traffic in Kelowna is legendary for its intensity, so it is a relief to be away from that. Overall, our stay was a pleasant one and we will probably be back. There was some sign of attention to the landscaping while we were there, so hopefully they can bring the park back to its pristine setting. 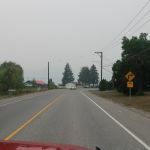 We camped at Orchard Valley RV Park in a Travel Trailer. Great wineries nearby, several large RV dealerships. Shopping mall convenient. Okanagan lake dominates the entire community, so water sports abound. The park is not oriented to children and there is no playground or amusements for the little ones. Are you affiliated with Orchard Valley RV Park ?